Whether a solar charger is your only option for adventures "off the grid," or you're just looking to green your everyday charging at home, portable solar chargers sound like a dream come true. Unfortunately, most solar chargers on the market today leave much to be desired. They don't charge fast enough. They never charge fully. Or they don't come with connective cables compatible with the device you need to charge. Though by no means an exhaustive list, below are review summaries of some of the most-reviewed portable solar chargers on Amazon.com, representing a wide range of price points. May it inform your purchase of a portable solar charger, be it one on this list or another you discover on your own that demonstrates superior qualities. If you're looking for a super-economical charger, this could be a good product for you. Just be advised you cannot charge devices while the unit is charging in the sun. Fully charge it first, then charge your device. It takes 1 to 2 days to fully charge in the sun. Some users recommend first charging the unit fully with a wall adaptor then never letting it lose its charge completely. It's also worth noting that some users have experienced confusion about the on/off switch. And you may need to purchase connectors to make the unit compatible with your devices. Considering the sun will only charge the internal battery up to 50 percent, customer satisfaction with this product is relatively high. About the size of an iPhone, this ultra-thin model is exceptionally travel-friendly. Users seem to be especially fond of the built-in LED reading light. At just 14.8 ounces, this foldable solar charger is made to fit comfortably into a backpack, glove box or large pocket, though that would have to be some large pocket, as the unit is 9 inches long (4.5 inches wide and 1 inch thick). The solar panels are made from Copper Indium Gallium diSelenide (CIGS) panels, the most efficient thin film solar technology, with 5 watts maximum output. In fact, the unit boasts a 90 percent efficiency rate, at least according to the manufacturer. Of course, the true test comes in the field. How well does it perform for users? Overall, it performs very well. Though it does not have an internal battery, requiring you to charge your devices during the day when the unit is in full sunlight, it apparently charges fast. But for more flexibility you can purchase an external Brunton battery to store a charge for use anytime, anywhere. Numerous reviewers of this product complain that, even in direct sunlight, it takes anywhere between 8 hours and a day-and-a-half to charge fully (if it charges fully at all). In some cases, the product charges just fine at first, but evidently loses its efficiency pretty quickly. This thin, lightweight, weather-resistant product sounds like the ideal charger to travel with. It even comes with 15 different connectors to help ensure it's compatibility with whatever device you have in mind. But even a 1.5-pound device can start weighting you down if it's not going to do its job. NOTE: Though its name identifies this device as a laptop charger, it will also charge other devices. Portable solar chargers leave much to be desired. But provided you do not expect perfection, they are certainly an eco-friendly supplement to our device-intensive lives. 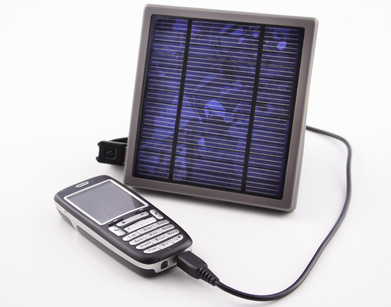 From cell phones and iPods, to iPads and laptops, charging them with any amount of energy from the sun makes a difference.